In this article, I will explain about Ex Factory Price used in any business, especially in Export and Import business. What is Ex Works cost? Is Ex-works and Ex-factory same under delivery terms in an international trade? How does Ex Works terms of delivery work? Ex works price and Ex-factory price are on of the same term. 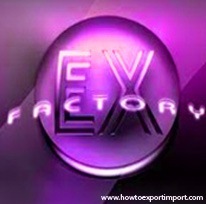 Ex factory or Ex works term is one of the delivery terms used in exports and imports. What is ‘Ex-factory’ terms in Imports and Exports: Ex-factory price means, the selling cost of goods from Seller's factory. All other expenses from the factory of seller to buyer's premise has to be born by the buyer. So the responsibility of getting goods from the seller’s factory is with the buyer. Here the buyer appoints a shipping and freight forwarding company to collect goods from the seller’s factory to the buyers place including insurance of goods. Here, I have explained about Ex Factory terms used in exports and imports. Would you like to share your experience in handling Ex works terms of delivery? Share your understanding about Ex works terms used in international trade. kumar: On 25 July 2013 As per my knowledge, the party should mention specifically whether date of invoice or date of bill of lading. Admin: On 25 November 2014 Hi Rajiv, As you know, the exporter (seller) invoice is used for import customs clearance. Bill of Lading and Export Promotion copy of Shipping Bill (EP copy) are treated as document proof for export. Regarding triangular shipment, please read my other articles about the same. Kumar: On 21 March 2015 This article is of great help to me being first time merchant exporter. We have an export order with EXW terms which contain 18-20 lots of machinery/pipes/valves to be procured by me from different factories of chennai/B'lore/Mumbai/Nasik. The buyer will clear 90% payment EXW basis against inspection. Can we treat each of my vendor premise as a point of sale as the inspection is arranged at differant places? Is there any documatation haziles? adam: On 08 February 2017 who pays taxes and duties on ex works? Robel hossain: On 08 April 2017 Good evening, actually I want to be clear that is there any difference between Ex-work and Ex- factory? Ajeesh: On 05 March 2018 The details explained about EX-WORKS under inco terms is excellent.